Cancer immunotherapy seeks to elicit or augment the antitumor immune response in a patient in order to enlist the help of the patient’s own immune system for tumor control. In this context, immune monitoring provides evidence of immunogenicity, guides the choice and dosage of antigens, assesses the effects of immune modulators and therapy combinations, and has the potential to reveal early biomarkers of clinical efficacy. In view of their role in the anticancer immune response, the quantity and quality of tumor antigen-specific effector CD4+ and CD8+ T cells are of particular interest, and characterization of regulatory T cells and myeloid-derived suppressor cells is increasingly relevant. The canonical multiparameter assay for the characterization of immune cells is polychromatic flow cytometry, and it is ubiquitously used for immune monitoring in preclinical tumor immunology and in cancer immunotherapy trials. 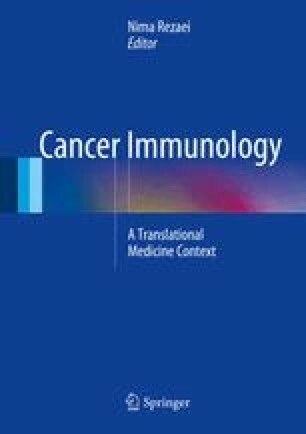 This chapter describes the main flow cytometry methods being applied in cancer immunotherapy, with an emphasis on recent progress in the field, challenges associated with quality control, its promise to reveal biomarkers of clinical efficacy, and further developments that are likely to be rapidly implemented in routine cancer immunology. CG, SW, MJP, SvB, CO, and CB are members of the steering committee of the CIMT Immunoguiding Program (CIP). The CIP and CC are supported by a grant of the Wallace Coulter Foundation (Miami, Florida). CG is supported by a grant of the Deutsche Forschungsgemeinschaft SFB685. CC is supported by grants to the Duke University Center for AIDS Research and EQAPOL program funded by NIH grant 5P30 AI064518 and NIH contract HHSN272201000045C, respectively. We thank S Heidu for excellent technical assistance. World Health Organization. Good Clinical Laboratory Practice (GCLP) 2009. Available from: http://www.who.int/tdr/publications/documents/gclp-web.pdf. GCP Inspectors Working Group EMA. Reflection paper for laboratories that perform the analysis for evaluation of clinical trial samples 2012. Available from: http://www.ema.europa.eu/docs/en_GB/document_library/Regulatory_and_procedural_guideline/2012/05/WC500127124.pdf. Medicines and Healthcare products Regulatory Agency. Good clinical practice. 2009. Available from: http://www.ema.europa.eu/docs/en_GB/document_library/Regulatory_and_procedural_guideline/2012/05/WC500127124.pdf).